Amazon, for all its conveniences, isn’t like walking into a traditional retail store. Amazon is a full marketplace that connects you not only to their own store, but to third-party sellers. This was driven home for me when I recently bought one of the top mini PCs on Amazon and found it came with a pirated Windows license. The lesson: Be careful with third-party sellers on Amazon. 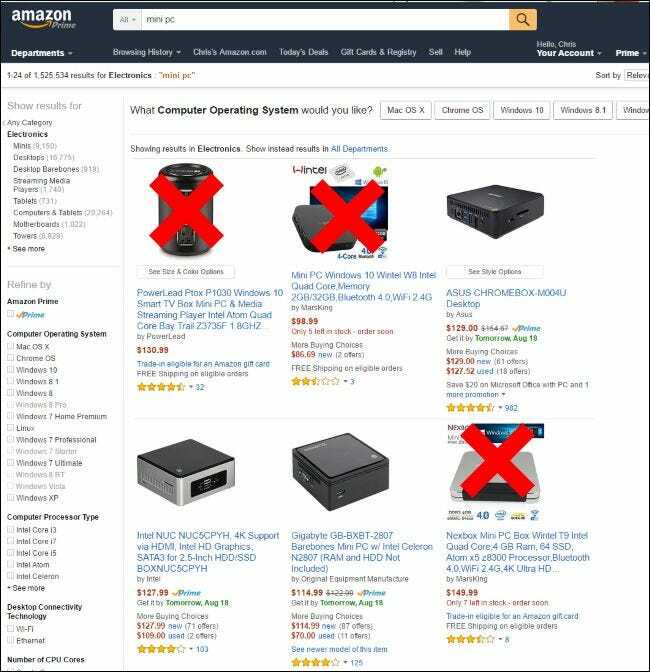 Anything not sold by Amazon itself has not been thoroughly vetted by them, and could be a counterfeit or pirated product. That’s true even if a product is marked “Prime”–just because something ships from Amazon’s warehouses doesn’t mean the product is legitimate, or sold by Amazon themselves. I wanted a cheap mini PC to use as a media center for my TV, so I headed to Amazon–where I do a lot of my shopping–and searched for one. The particular PC I purchased was sold by “MarsKing“. Sure, that’s a Chinese manufacturer I’ve never heard of, but it’s solid Intel hardware inside. It was also marked by Amazon as the “#1 New Release” in this category and had solid 4-to-5-star reviews at the time. It even had a “Prime” logo, which meant that it would be shipped to me from an Amazon warehouse. Looks legit, right? Nope! The PC came with a KMS Loader activation crack installed and was using a KMS key–a common way to activate pirated Windows licenses. Windows Defender found the KMS activation crack and complained about malware as soon as Windows Update ran automatically. After I left a bad review and returned the product to Amazon, MarsKing contacted me through Amazon with an offer: “We would like to sell you a new pc box with legitimate [Windows license] at 50% money off as apologize.” I didn’t take them up on it. Other manufacturers are sneakier. PowerLead, which makes the top mini PC on Amazon, describes its product as such: “This PowerLead Windows 10 Smart TV Box Mini PC is with trial win 10 operating system. If you need to buy the original version, please update online”. But someone in the comment helpfully notes that the PC seems to activate anyway. It’s unclear as to how. Most people don’t realize this, but Amazon doesn’t actually sell most of the products on Amazon.com. Instead, most products sold on Amazon.com actually come from “third-party sellers”. Amazon just functions as a marketplace, connecting you and the seller. Even if a product is marked as “Prime” and is from Amazon’s own warehouse, it may be simply “fulfilled by Amazon”: a seller ships its products to Amazon’s warehouse and then Amazon ships them to you. Amazon isn’t actually selling the product, and hasn’t vetted it. In 2015, a RW Baird report found that 83% of the products purchased from Amazon.com were sold by third-party sellers. Surprised? So was I. Amazon doesn’t do a ton to make the distinction between third-party sellers and sold-by-Amazon products. 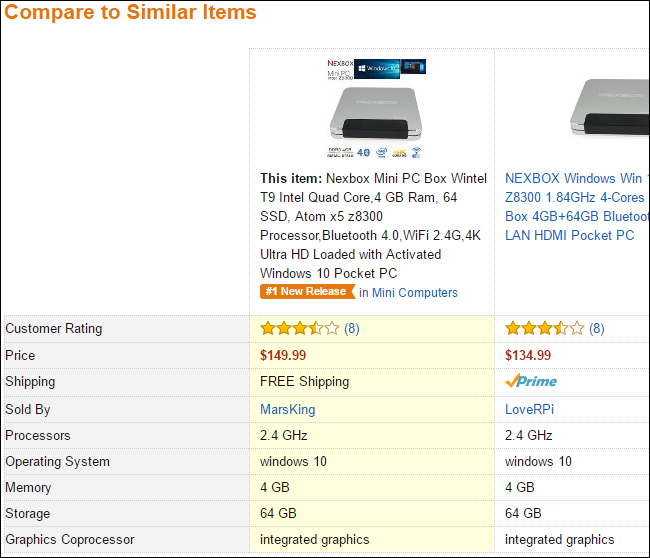 And, apparently, they don’t vet third-party-sold products very closely either, even if Amazon’s doing the shipping. In July 2016, CNBC wrote that counterfeiting on Amazon.com had “exploded” in 2016, according to many Amazon sellers. The problem, often, is that third-party sellers will list cheaper options on the very same product page, but those cheaper options will be counterfeits. But, as we saw with PCs, it’s possible that manufacturers might actually assemble products with pirated software and other flaws and market them as legitimate. In 2013, the Daily Dot purchased a counterfeit charger from Amazon. It melted the first time it was connected to a power outlet. We’d be particularly worried about buying phone and laptop batteries from third-party sellers on Amazon, as counterfeit phone batteries are a serious danger that could cause explosions and fires. We wish Amazon would do more to combat this problem. But in the meantime, how can you avoid situations like this when shopping on Amazon.com? Here are a few tips. Ships from and sold by [Name of Third-Party Seller]: When you purchase this product, Amazon gets a cut–but Amazon isn’t otherwise involved in the transaction. The product is sold by the third-party seller and is shipped from them directly to you, not unlike eBay and other online marketplaces. Most counterfeit and pirated products will probably be shipped directly from a third-party seller. Sold by [Name of Third-Party Seller] and Fulfilled by Amazon: Products that are “fulfilled by Amazon” may have the “Prime” logo that makes them look like they’re sold by Amazon–but they aren’t. You’re still buying a product from a third-party seller. The third-party seller ships that product to Amazon’s warehouses and Amazon ships it to you. However, Amazon doesn’t necessarily confirm that the product is legitimate before shipping it to you. Ships from and sold by Amazon.com: The product is actually sold by Amazon.com, and it should almost certainly be legitimate. This should go without saying, but check out the reviews–not just the 5-star rating–for any product you buy on Amazon, especially if it’s from a third-party seller. Many reviews will specifically call out a counterfeit product, which should immediately be a red flag. That said, good review scores don’t necessarily indicate a product is legitimate and authentic. A product may have a bunch of fake five star reviews to make it look more legitimate, not real reviews from actual customers. While bad reviews are obviously bad, very good reviews can also be suspicious. If you see many five star reviews without much explanation or very similar writing, that suggests the positive reviews may be fake. Be sure to check the recent reviews, too–not just the overall product reviews. A product may have a lot of positive reviews from past transactions, but a few recent negative recent reviews may suggest that they’ve changed something about their product. 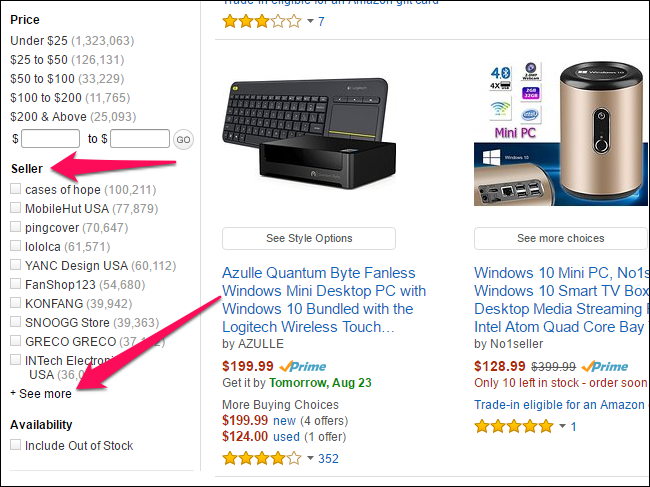 You can also choose to search for products sold by Amazon itself, although Amazon doesn’t make it easy. After searching Amazon for a product, scroll down in the left sidebar and find the “Seller” section. Click the “See More” option and then select “Amazon.com” to see only products sold by Amazon. Of course, this will get rid of a lot of products from your search results too. In a lot of cases, this may not be a problem–but for certain categories that Amazon doesn’t sell a lot of products for (computer parts, lawn & garden, or cosmetics, for example), this tip may not be too useful. We reached out to Amazon, who declined to comment on this story in particular. They did, however, point us towards its official policies: The A-to-z Customer Guarantee and Amazon Anti-Counterfeiting Policy. The A-to-z guarantee guarantees purchases made from third-party sellers, entitling you to a refund if the seller ships you a product that doesn’t match the description, fails to ship you the product within the advertised ship time, or won’t accept the product for a replacement. The anti-counterfeiting policy forbids the selling of counterfeit products on Amazon and says that Amazon may terminate seller accounts and destroy inventory in Amazon fulfillment centers if it discovers counterfeit products. Amazon does still seem to have good customer service. I was able to return the PC to Amazon with no issues–all I had to do was fill out a quick online form and say the product wasn’t what was advertised. I then shipped it right back to Amazon’s return department using a free mailing label Amazon had me print out. But these policies are after-the-fact protection. Shopping on Amazon isn’t the same as shopping at Best Buy or another brick-and-mortar retail store. It’s more like shopping on eBay–Amazon.com is often the middleman that connects you with a seller, not the store itself. Amazon doesn’t necessarily examine or vouch for the products being sold on its website before they reach you. That’s something most people don’t understand about Amazon, but should.